Tim Borski and I collaborate from time to time and it always seems like our conversations result in interesting stories and new ideas . Recently he invited me to review some vintage photos. The following fly pattern was in one of the pictures. Tim was kind enough to provide the story behind it, images and recipe for the Way Upstream community. 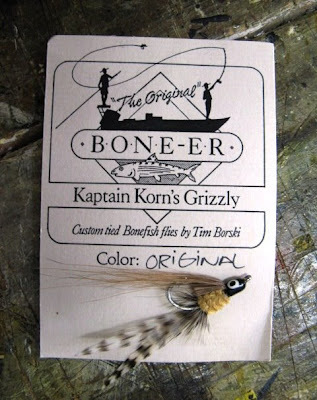 Tim said, "Kaptain Korn's Grizzly BONE-ER was the first fly I ever tied for commercial/selfish purposes. It was accepted by a great old guy named Bob Kay. He and his partner, Tripper, allowed me to hang and sell it in their fly shop, Anglers Afield in Ft. L'dale. All I wanted was to see my name on their wall. The fly was for bonefish. I caught a ton of them on this pattern over the course of a couple or four years, then got better at tying." This is great. I basically stole a pattern from Tim and Brian O'Keefe and mutated it in to one pattern. It has been my best Keys bonefish fly. I can't remember the book I found their patterns in, but it was all about saltwater patterns. Might have been one of Bob V. books from some years ago. Anyway the grizzly on this fly reminded me of my "Pirated Combo Bone-er". Got me thinking so I found the book. "Innovative Saltwater Flies", Bob Veverka 1999 (man I feel old, cause it seems like last year). I mutated these 2 flies. I sure don't claim to have invented any patterns and thank both these guys for the inspiration to tie it. I credit my A.D.D. as well, as I can only tie a couple of the same flies, before I have to try something new. P.S. All I know is that the yellow eyes, and cree colored grizzle hackle seems to make it much more effective. Craft fur ROCKS!!! I'm glad the BONE-ER post got you thinking about other patterns, materials and your own experimentation. 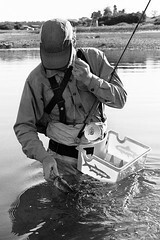 I like to post this type of content for just that reason, especially as we enter fly tying season.